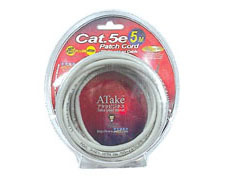 A Category 5E Patch Cable consists a length of cat 5E cable with an RJ-45 male connector, crimped onto each end. The cable assembly is used to provide connectivity between any two category-5E female outlets (jacks). The two most common are from hub to patch panel, and work area outlet (jack) to the computer. Our high performance CAT5E patch cables are perfect for connecting a PC to a network. These 350MHz stranded cables are assembled with enhanced RJ45 connector, made from 24AWG cable with a PVC jacket and molded boots. Made from 24A WG stranded category 5e cable with a PVC jacket.